Great care and attention is placed in the hand crafting of each Irish Telephone Box. Each box is made at our manufacturing facility based in the heart of Dublin, Ireland. Traditional concepts have been fused with modern techniques to help create this iconic product. 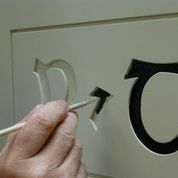 Every intricate detail is carefully carried out by our highly trained and dedicated master craftsmen. Great skill is needed in creating the identical scaled model that was seen and remembered fondly by generations of Irish people. From the iconic P&T and Telefon logos, to the traditional pull handle and authentic joinery mouldings, each detail has been carefully considered and applied throughout the product range. Each Irish Telephone Box is carefully manufactured at our world class ISO14001 certified facility, while all the raw materials used in the manufacture of the Irish Telephone Boxes have full chain of custody. Our product range can be supplied with either FSC® or PEFC certification. The Irish Telephone Box. Hand Crafted by Burke Joinery Ltd in the heart of Dublin City, Ireland.